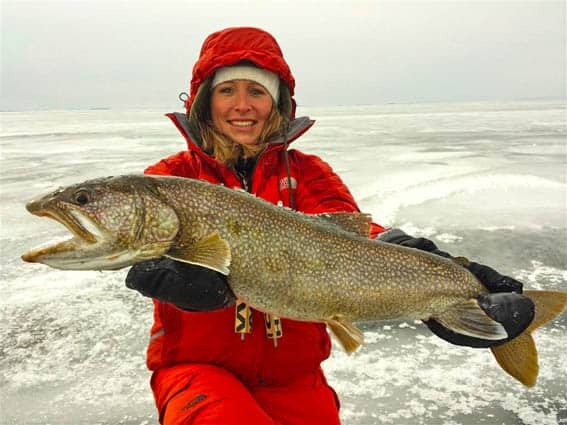 Kelly Brooks of Waterbury caught this 30-inch lake trout while ice fishing on Lake Champlain in early 2015. The Vermont Fish & Wildlife Department has released its annual Master Angler program report and 35 Vermont anglers have garnered Master Angler status for 2015. Now in its sixth year, the Master Angler program was developed to recognize the achievements of anglers who catch trophy-sized fish from Vermont waters and celebrate the growth and survival of such fish. The program also aims to encourage anglers to improve their knowledge of fish habitat and behavior, and develop the skills required to target and catch a wide variety of fish species. In order to achieve Master Angler status, anglers must enter trophy fish of a minimum length for at least five different species. Anglers are required to submit a photograph of their fish, along with accurate measurements and catch data, including when, where and how the fish was caught. Anglers must also indicate if the fish was harvested or released. three trophy fish entries became new all-time state records for Vermont. These include record fish for the species of yellow perch, cisco and redhorse sucker. 13 adult anglers and five youth anglers earned Master Angler status for the second year in a row. Trophy fish entries were received from 85 waters throughout the state. As in the past, the most entries (366), came from Lake Champlain. 58 percent of trophy fish entered were released to continue to grow and potentially be caught another day. Good also said results of the program year in and year out demonstrate the exceptional quality of fishing opportunities around the state. The traditional Master Angler program will continue for 2016, but department officials have also added a new bonus challenge to continue to test participants’ angling skills and fish knowledge. To complete the bonus challenge, anglers must enter trophy fish for the categories of coldwater, warmwater, panfish, and alternative, plus one “wild card” species. The 2016 bonus challenge species are: lake trout, chain pickerel, fallfish, yellow perch and white sucker. To view the full 2015 Vermont Master Angler program report, browse past fish entries or enter a trophy fish, visit Vermont Fish & Wildlife Angler Program.